"Lava Splash", Sweep and Fall Series. "Lava Splash II", Sweep and Fall Series. "Pink Sweep" 1986, Sweep and Splash Series, acrylic on paper, 36 x 48 in (91 x 122 cm). 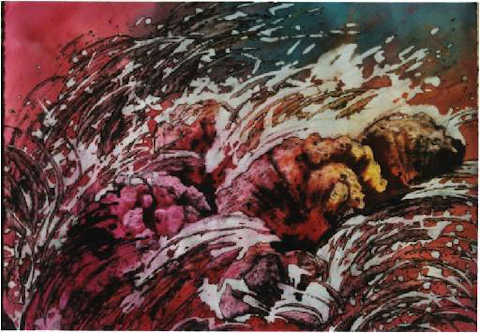 "Brown Splash" 1976, Sweep and Splash Series, acrylic on paper, 36 x 48 in (91 x 122 cm). "Pink Sweep", Sweep and Splash Series. "Purple Sweep", Sweep and Splash Series. "Splash", Sweep and Splash Series. "Splash to Left", Sweep and Splash Series. "Sweep to Right", Sweep and Splash Series. "Wind", Sweep and Splash Series.